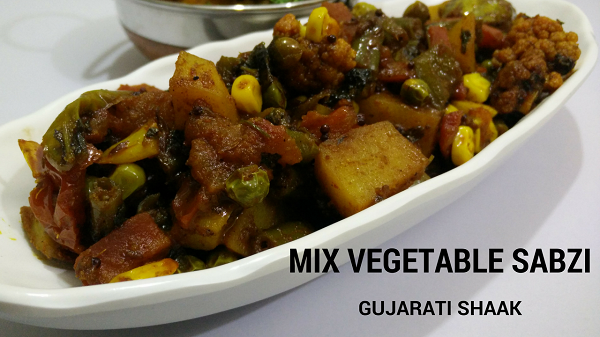 This Mix Vegetable Sabzi is yet another traditional Gujarati Shaak I make every fortnight at my home. It is made from lots of vegetables & spices and using very less Oil which makes it a Healthy & Tasty. When you can’t decide which sabzi to make for lunch or dinner, take all the available vegetables in your kitchen and make this Mix Vegetable Sabji. When Oil is slightly warm, add Mustard Seeds, Cumin Seeds, and Asafoetida. Add Garlic, Curry Leaves, Green Chillies, sauté for more 30 seconds. Now add Vegetables – Carrot, French Beans, Cauliflower, Green Peas, Sweet Corn and Potato, mix well. Add Tomatoes and all spices – Dhana Jeera Powder, Red Chilli Powder, Kashmiri Chilli Powder, Turmeric Powder, Garam Masala, Salt, and Jaggery. Add Jaggery as per your taste. Add ½ cup water, cover with a lid and cook for 10 – 12 minutes over medium flame. After 10 minutes, add Capsicum, Brinjal, Spinach or Fenugreek Leaves and Fresh Coriander. Mix well and cook for 5 minutes without the lid. After 5 minutes, cover with a lid and cook for another 5 minutes over low flame. Sabzi / Shaak is ready to serve.